Started cleaning of a newly arrived small black case. The clasps had a brown hue and the rest of the fittings were a dull grey. Amazing how the power of Brasso can bring it back - must have been very shiny when new with all that chrome, flashy even. Right side now given a first polish, left side as it was. Very versatile and useful item; Brasso! I find cleaning and polishing the shiny parts so satisfying. The fittings look great after some Brasso. Nice! I've never tried this product. I use Mother's Mag & Aluminum Polish. It's a miracle what a little polishing can do! Brasso does the job. Congratulations on the new Royal. QDL? Tnx. It's a DL - shiny! 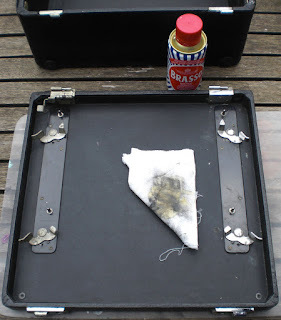 I used to make home made brasso for degreasing etching plates. Dilute ammonia with talc. It is the fine particles that do the gentle abrasion. In the UK, Brasso is a sort of staple though I use Autosol paste (great on aluminium) and a cotton wad based Duraglit. And you are of course right, nothing like a shine to put a smile on your face.